Me: Shanda, What is the writing life like for you? Me: I feel so lucky to be in the same critique group with you! What does our Trail Mix group mean to you? Me: What would you say to an aspiring writer who feels alone on the journey? I’m sure there are plenty of writers out there who can navigate their minds and lives alone with ease. But I cant. (Not very well anyway.) But I’m gonna be okay. I’ve got my “Trail Mix” critique group sisters. I’m so lucky! I’m so proud of you Shanda! Of all that you have accomplished of course, but mostly that I get to call you friend and be on this amazing kid lit journey with you! 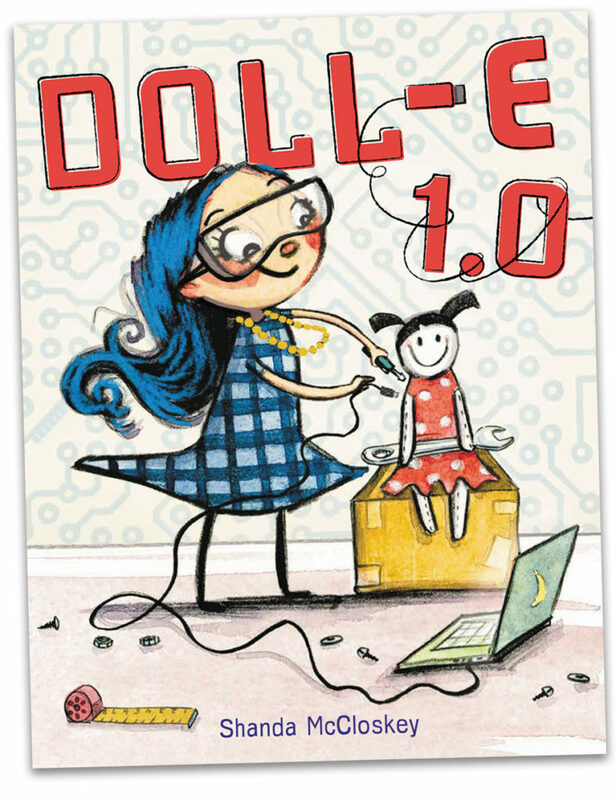 Click here to purchase Shanda’s incredible debut picture book Doll-E 1.0 and be on the lookout for another title by Shanda next year! 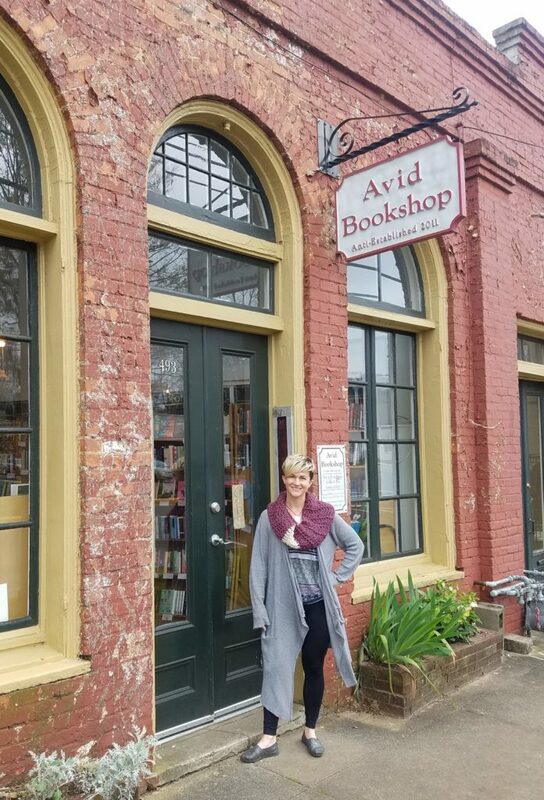 Our next stop on the bookstore blog tour brought us to Athens, Georgia, the home of The University of Georgia. If you’ve never been to Athens- it is a quaint little town that bleeds red and black, and Bulldogs comprise the bulk of the décor. I was a little nervous that they would sniff me out being that I graduated from their rival school- Georgia Tech, but this Yellow Jacket stayed undercover. 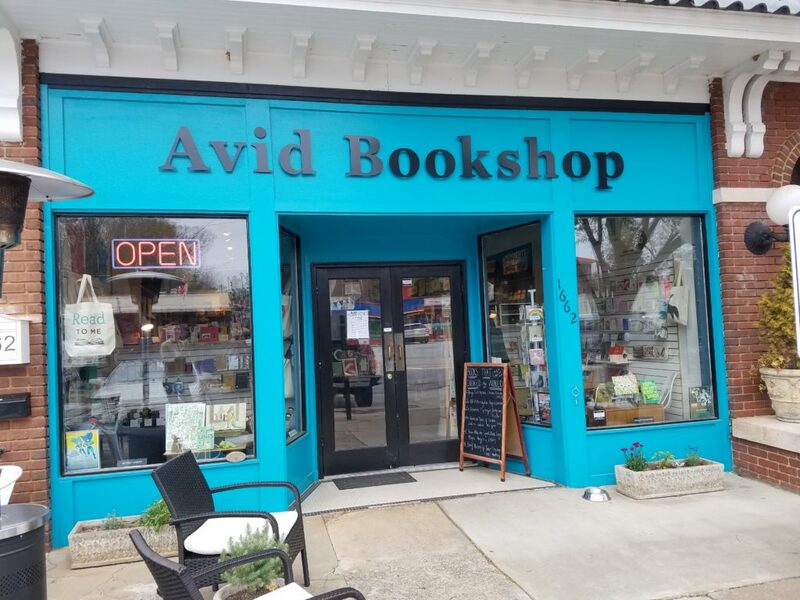 We were there to visit Avid Bookshop, a neighborhood store open since 2011. 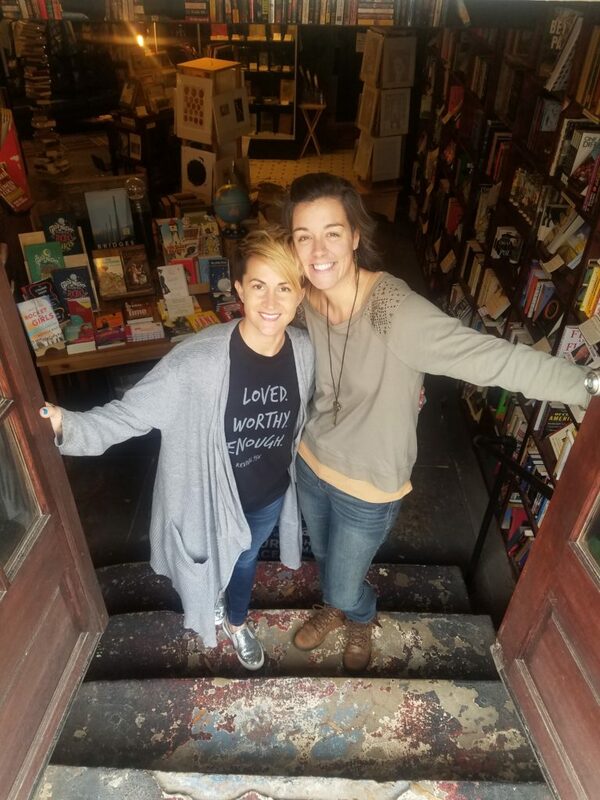 Since their inception they have made quite an impact in the bookish world, even named one of the top 5 bookshops in the U.S. by Publisher’s Weekly in 2017. 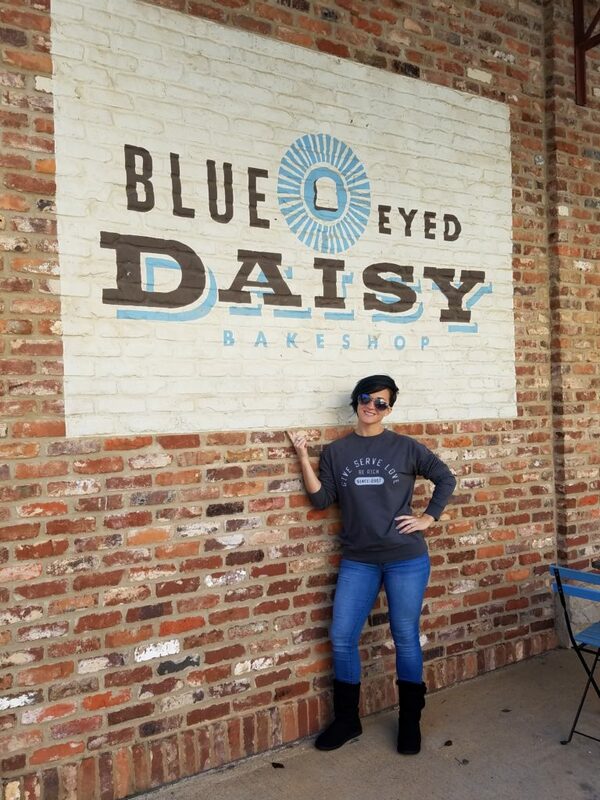 Recently they opened a sister store by the same name in the Five Points in the community. So of course we had to visit both!! The original store is located in a historic building between two streets with entrances at both ends of the store. The beautiful doors and large windows gave you plenty of book browsing natural light. I loved how inviting the space was just inside the “front” doors. Little gift ideas and seasonal displays to welcome you. I also noticed (and personally love) how well organized every section of the store was, by genre and interest. Each chalkboard sign made it easy to find exactly what you were looking for. If you look closely you will notice the book lights hanging from the ceiling. These and the calming blue sky and cloud walls added a fantastical touch to the overall personality of the store. We were greeted by a friendly and knowledgable staff person, Elizabeth, who told us about the store, informed us of their sister store not far away and gave us an excellent lunch spot suggestion. (GRIT) We learned of their book club program where they will actually send you a book every month. Very cool. Near the register I noticed something that looked a bit out of place. A bathroom door covered with sharpie graffiti. 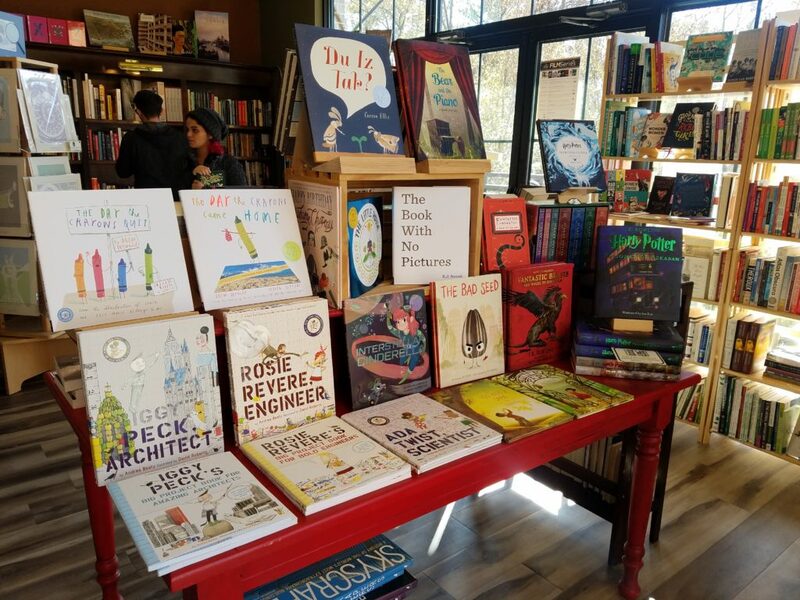 Of course you know that what I really interested in seeing when I visit a bookstore is the clever children’s book section. 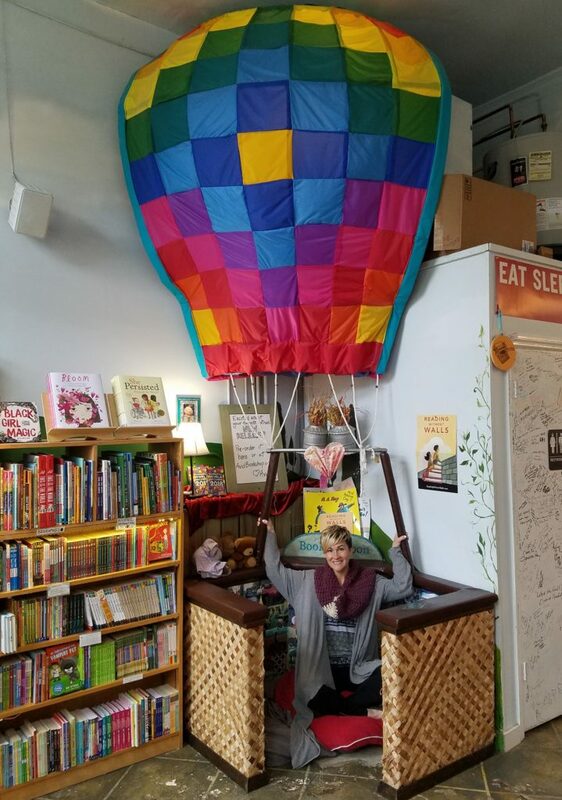 And Avid bookshop did not disappoint with this adorable hot air balloon reading nook! I just had to hop and take a ride! The collage pictures on the inside of the woven basket and the oversized pillows made this the perfect spot for a kid (or me) to curl up with a good picture book. The children’s books were also neatly and colorfully organized. This made me even more excited to see their sister shop. Look how beautiful this store is! This location definitely had a different vibe from the other one- a bit newer and shinier if you will. 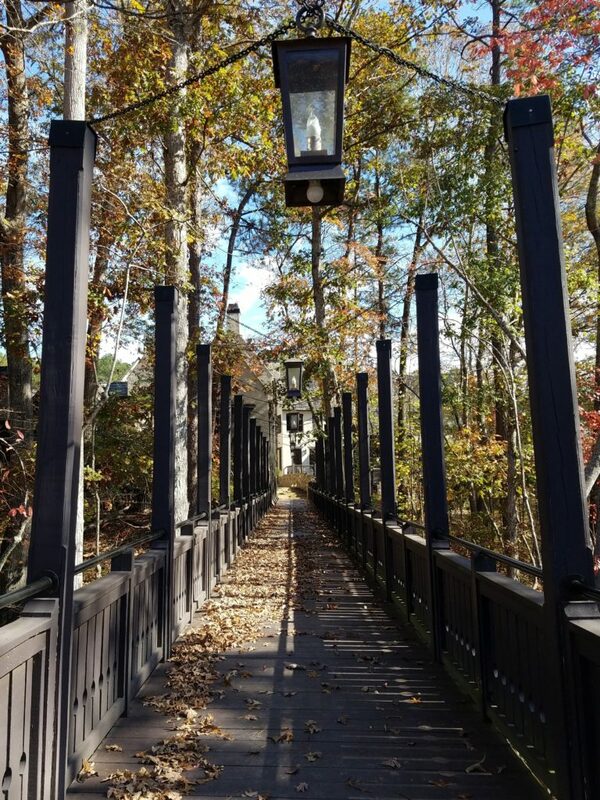 Another great location in the Five Points community with plenty of foot traffic. 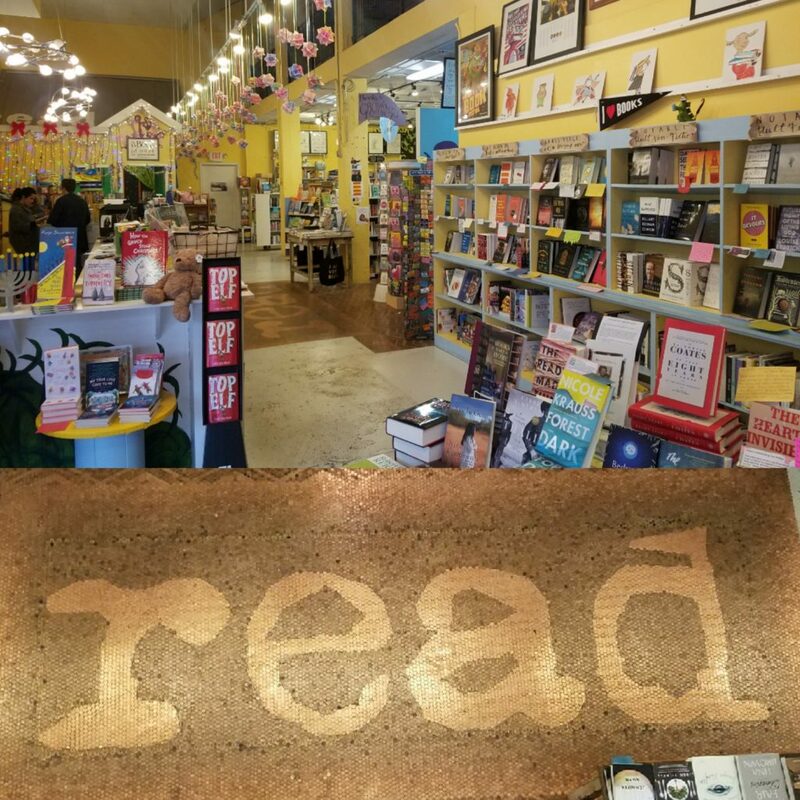 I loved the welcoming chalkboard tent sign with a list of “Books that Have Changed the World” The store was beautifully laid out and the staff was once again very friendly as they made a point to say hello and ask us if we needed help. We needed help for sure because we wanted EVERYTHING in the store! Once again, I adored all of the gift ideas including their “I am an Avid Reader” t-shirts and bags. 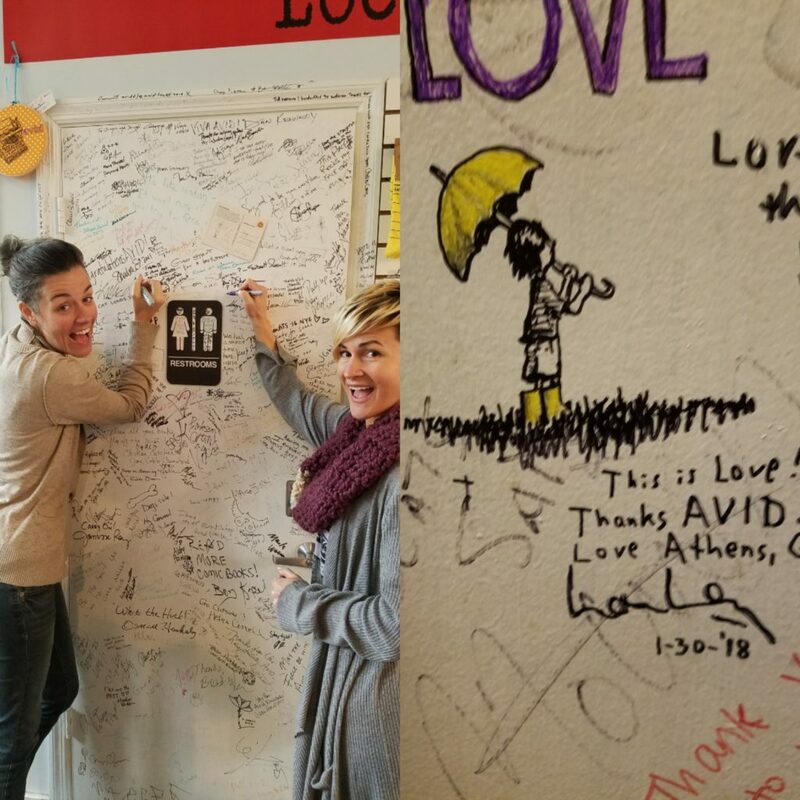 I would say our visit to Avid Bookshops in Athens, Georgia was a huge success! 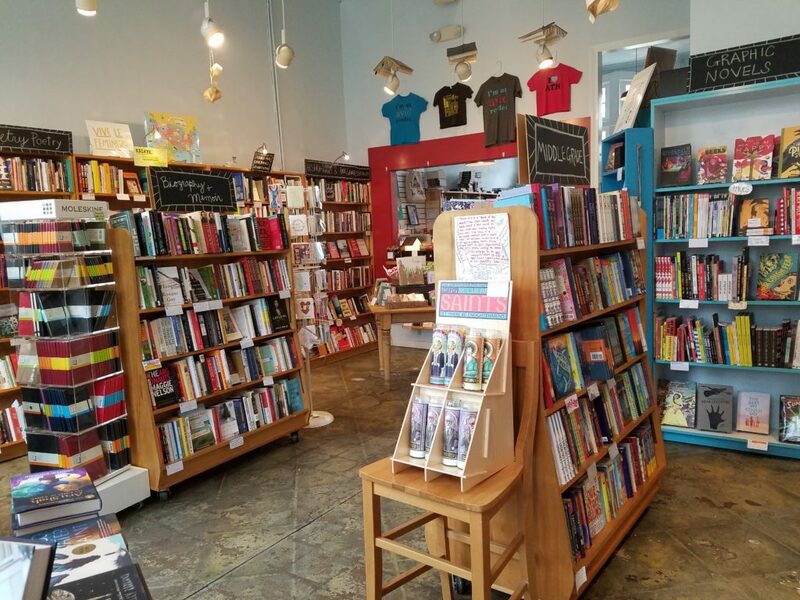 If you are ever in Athens don’t miss the opportunity to stop in BOTH stores and book browse to your hearts content. Until our next bookish adventure! The thing about spring in Georgia is that there isn’t one. It’s cold one day, a little warm tease and then BAM. Hot. So a few weeks ago when we had a blip of a warm day I immediately drove to Home Depot to get some ferns. You see, I have been eagerly awaiting the spring, when the earth wakes up and shows off. 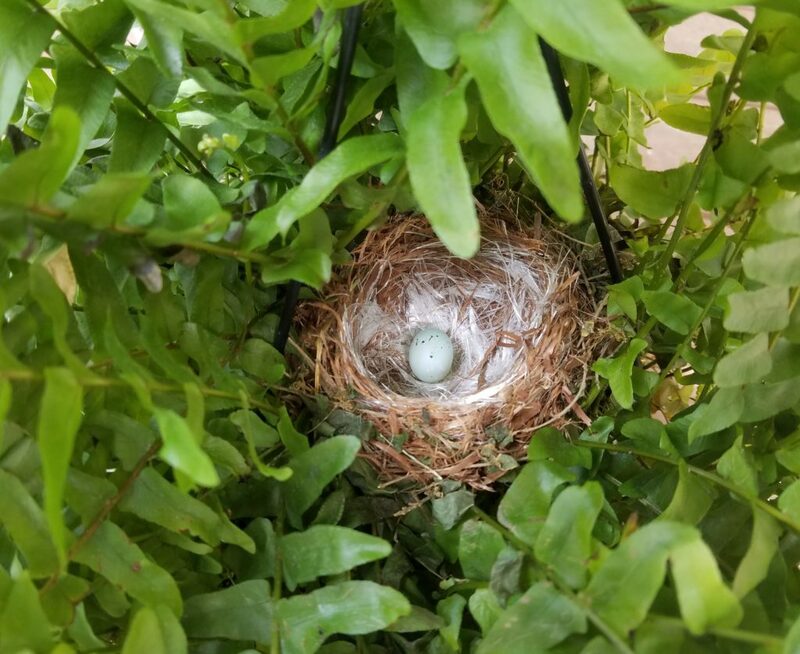 Last spring we had the amazing experience of witnessing two different birds make a nest in our front porch ferns and it was incredible. Well, one of them was incredible and one of them was incredibly sad. You can read about last year’s nests here. But I just choked out, “Oh. Ok. Well, when will you have them?” She told me they would have them in a couple of weeks, BUT I should still really wait until mid-April just in case we have another cold snap. I reluctantly thanked her, turned towards the parking lot and imagined her shaking her head slow and watching me walk away, “Poor girl doesn’t know the first things about plants.” Is probably exactly what she said. So I went home and for the next week I listened to the pleading of the birds. I filled up my bird feeders and assured them that I would provide some more than adequate lodging very soon. 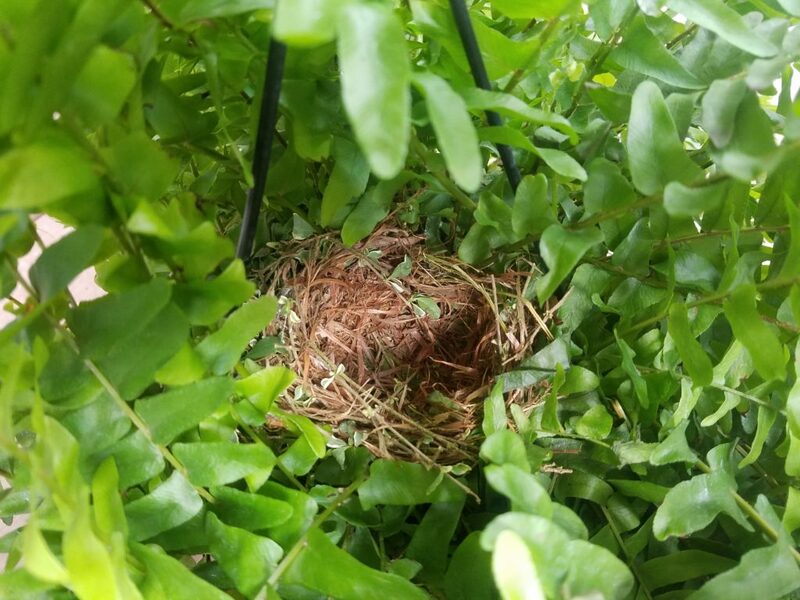 I told the kids that we would have a birds nest this year and my husband reminded me of the sadness of last spring- when my middle daughter and I buried one of the nests full of baby birds. The momma was found not far from the nest on the ground-some animal had intercepted her before she made it home. Yes it was sad, but I think it was this exact sadness that made me more hopeful than ever that this spring would be full of joy and life and baby birds. In fact, just as depicted in my favorite Pixar movie Inside Out, sometimes sadness is the avenue by which you arrive at life’s greatest joys. As exciting as it was to watch the first nest fill up with eggs and then witness the first flights, how much more exciting would it be this time around with a different perspective. A perspective of hope mixed with the reality that sometimes things don’t workout the way want them too. Because that is real life. But when we give up hope that things can be better we give up on life. I waited one week and journeyed back to Home Depot walking straight past the Fern Shamer Lady. I looked frantically around for ferns while avoiding eye contact with her. I found a different employee to ask, and he led me inside to a pillar of magical ferns. I swear I heard the hallelujah chorus and heaven opened up to shine a beam of sun on my ferns. I grabbed three and headed to a different register. But she saw me. And can you believe she actually recognized me, judged me and shouted across the aisle, “Be careful! We may have another freeze!” The nerve! I paid for them and pretty much ran to the car never looking back. You’re not going to rain on my parade lady!! I’ve got spring in my heart, hope in my hands and birdies on my mind! I flung those ferns up on the hooks and even put out welcome home bird seed all over the front porch. And in just TWO DAYS we had a nest!! A beautiful, perfect, ready for babies nest. The kids and I were ecstatic. Great job Momma bird! It looks perfect. Welcome to the Clark house. We’ve been expecting you. Because no matter what happens in life our job is to hope and prepare and expect good things. So every day we check our nest, careful not to touch, and we smile with Spring in our hearts. Counting eggs and blessings. 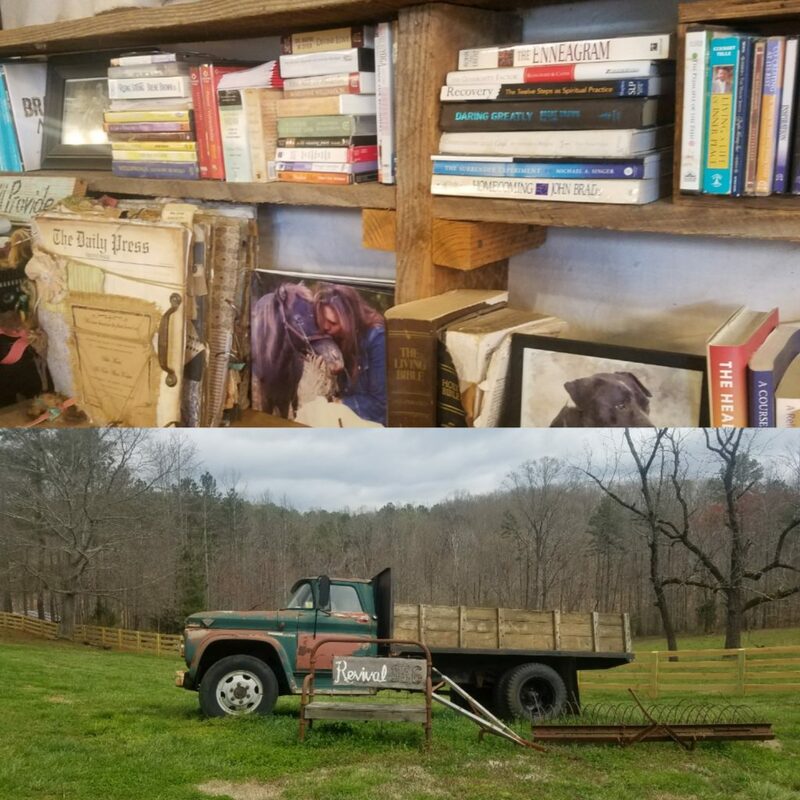 I wasn’t exactly looking for books when I came to The Farm. 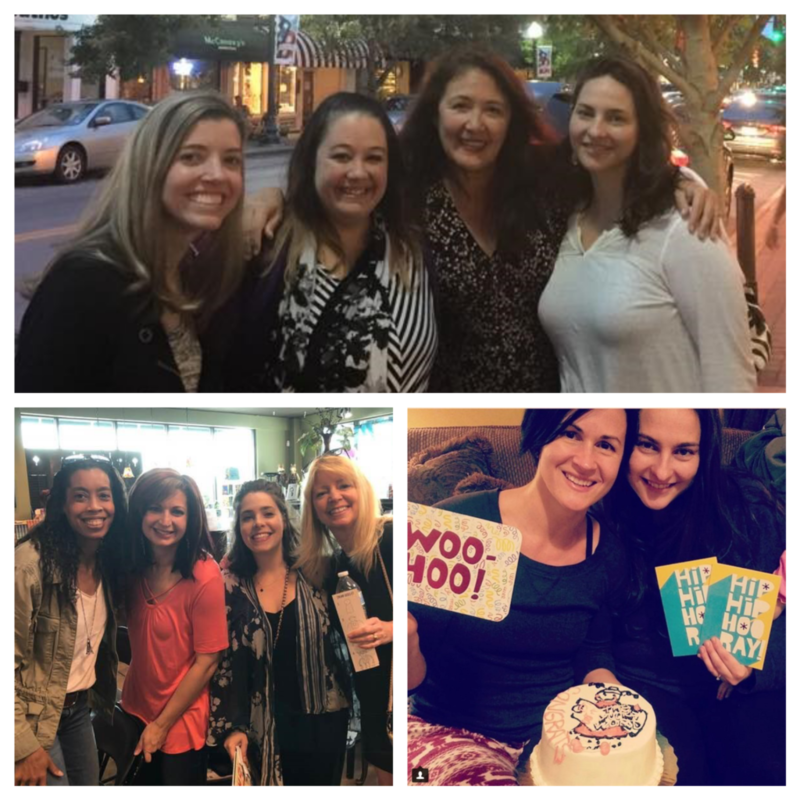 I heard about Vikki from a friend who told me that she found out about this woman who lives in Ball Ground, GA and encourages women to know that they are Loved, Worthy and Enough just as they are. The friend told me that Vikki had a unique and colorful backstory that included “Olympic bodybuilding” (which is not a thing), addiction and steroids. Well those subjects hit close to home for me- even Olympic weightlifting (which is a thing). Long story short, I did know Vikki from years ago when we both lifted weights at Coffee’s Gym in Marietta. It had been 20 years and seemed like a past life with all of the changes we had both been through. (Thank the good Lord!) 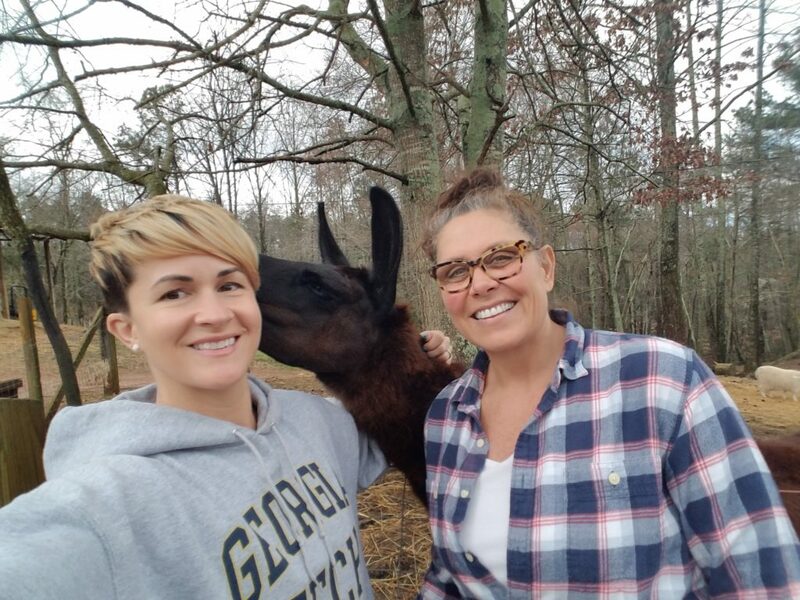 I was thrilled to hear about all the good things she was doing at her farm-Revival 356, and I wanted to go check it out myself. Here is me, Vikki and Lula-mae, the alpaca who likes kisses. The beautiful red barn was even more beautiful on the inside. It was a chilly day, but there was a fire burning and the smell of incense and earth filled the air. Every inch of the barn invited you to slow down and be loved. There were mismatched chairs and repurposed farm décor, fresh cut flowers and the occasional stray chicken or bird. There was a wall of pictures, bins of scrap metal, leather, and wood. A crafty person’s dream. 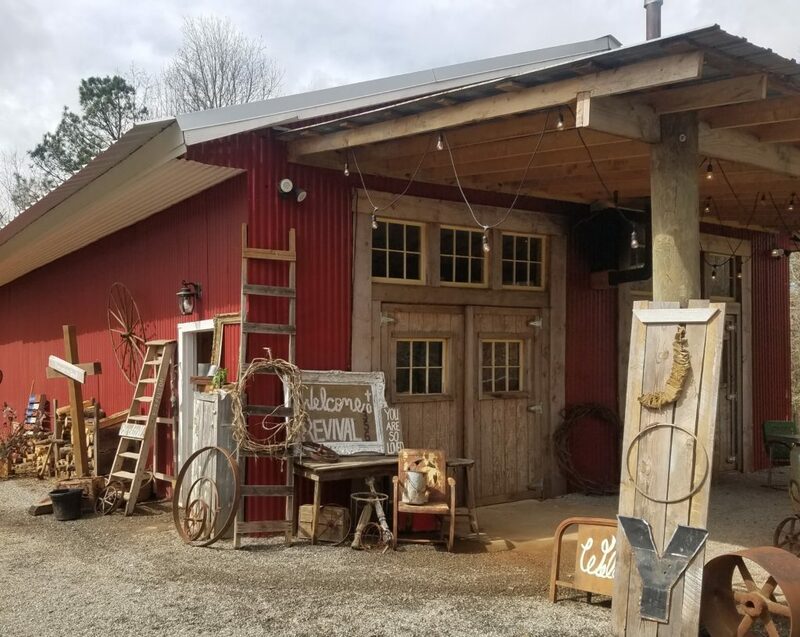 (They also hold art days and journal making classes at the barn monthly!) But what caught my eye was the books! 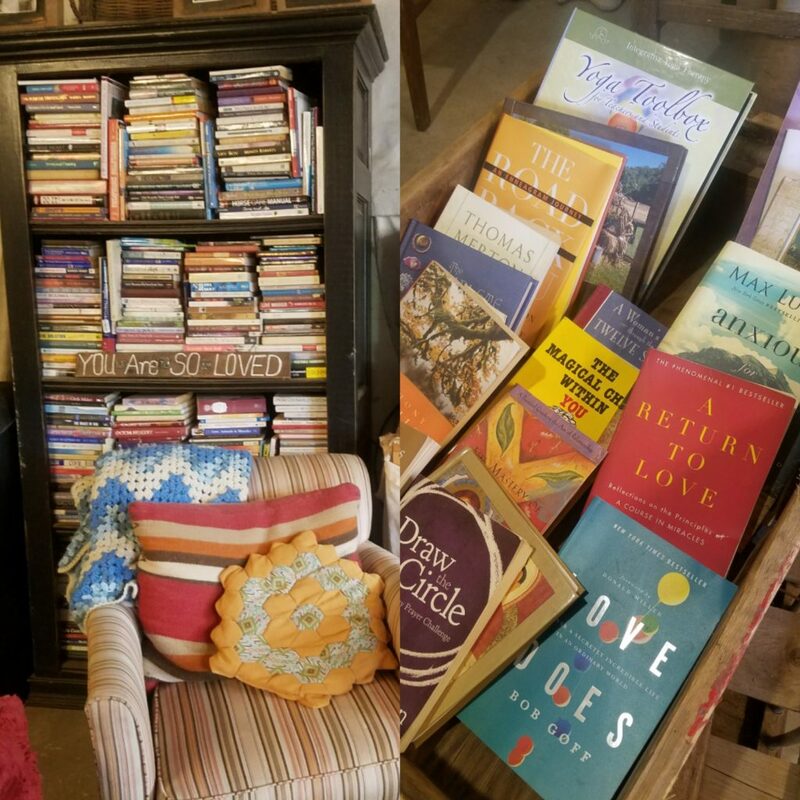 Shelves and boxes of books about love, spirituality, relationships and Jesus. My friends who know me know that this is TOTALLY my jam. (I’ve been reading Max Lucado since I was a pre-teen!) 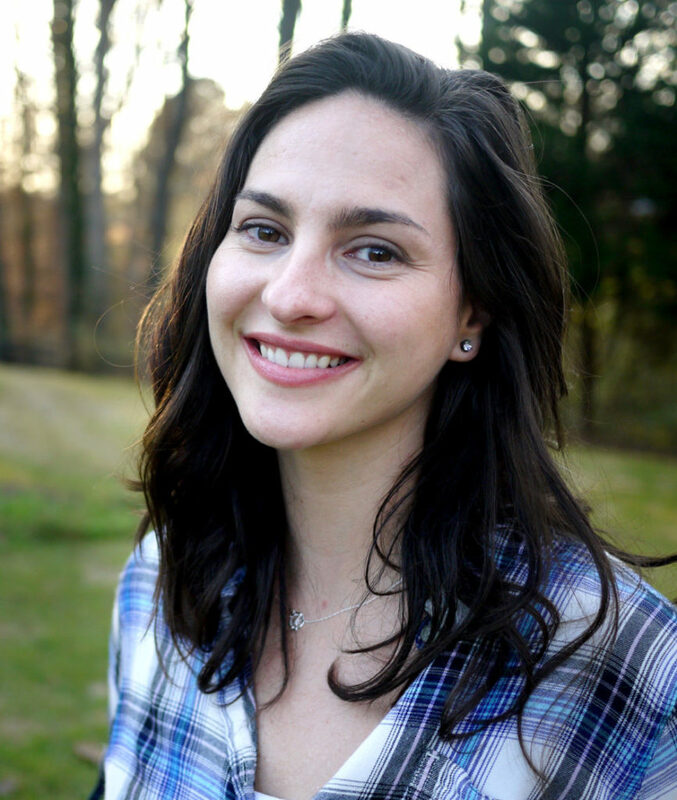 Vikki also loves to quote my BFF’s Brene Brown and Dr. Caroline Leaf AND she “feeds her soul” through yoga and meditation. My friends who know me know that this is TOTALLY my NEW jam! We sat around these piles of books and swapped stories. She showed me around the farm and told me all about her mission to help others discover that they are Loved, Worthy and Enough. I gotta say I’m not really an animal-lover, but I AM an animal-lover-lover. What I mean is, I dig people who are into animals and nature because they seem to be the kindest people around. 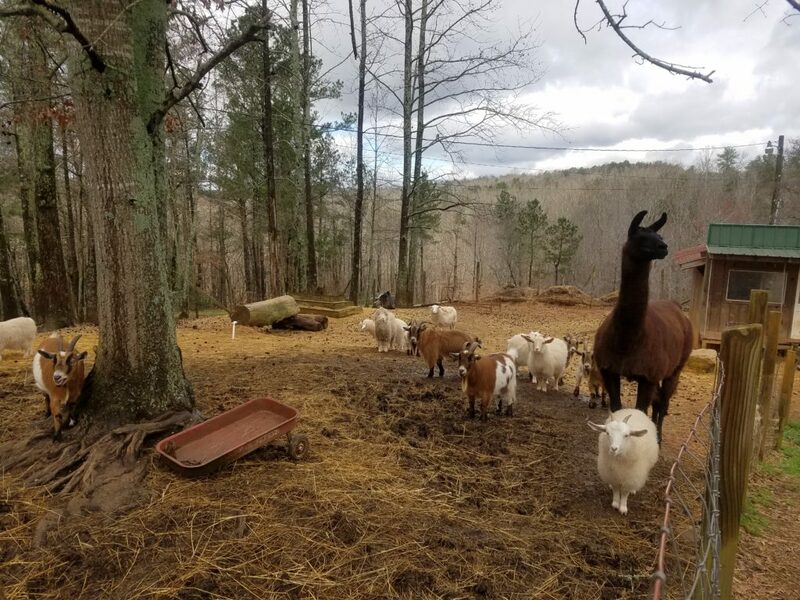 I am more of a people lover, but still I enjoyed the peacefulness of farm-life, and these goats are pretty stinkin’ cute. 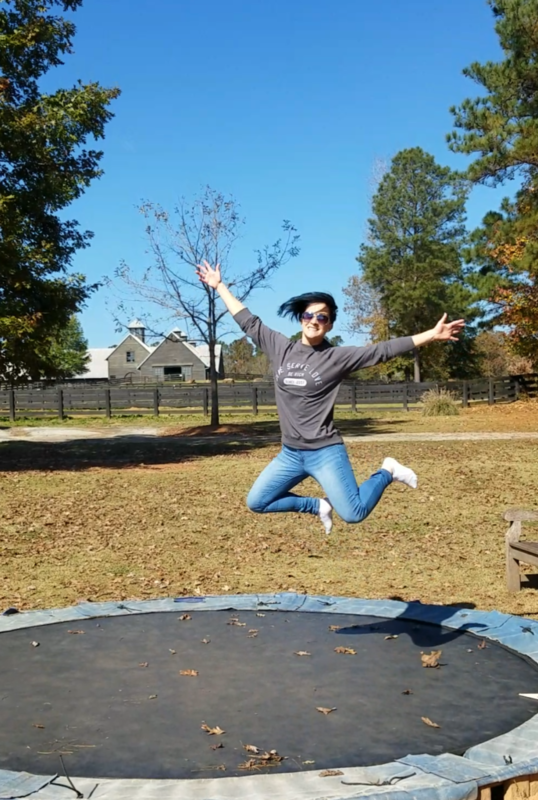 I love how Vikki uses all that she is and how God made her to communicate love loudly-even sharing a beautiful metaphor about a “fence-climber” sheep based from Psalm 23. I was so drawn to the barn and to Vikki that I decided to visit regularly for some “life coaching”. I wasn’t sure what that looked like, but I believe in counseling and getting godly wisdom so I went for my first session and was blown away. We didn’t even get through the first question on the list that she had me send in before our session. I’ve been to counseling before when I “needed it”, but this was different. I know I’m a work in progress but I like the direction I am headed. I’m an achiever. A goal-setter. And thanks to Brene Brown and Liz Gilbert I’m not really afraid to put myself out there and risk failing. 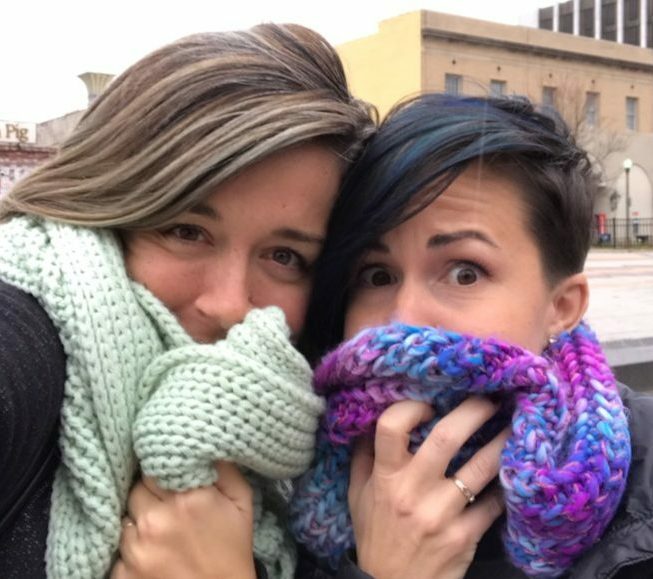 So, when I told Vikki that I was there to be a “better version of myself”, she said in her soft, sweet southern voice, “that sounds like a doing instead of being”, and BAM we talked for over an hour about THAT. It’s not that those things are a bad thing, it’s just that life is in the present, the moments, the breaths that we take. I can work on the Better-Future-Bonnie, but if I’m not treating the In-This-Moment-Bonnie with compassion and really being present, I’m missing out. I get that. And I want that. 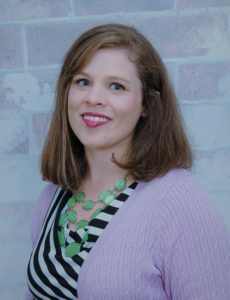 Vikki loves to say that she doesn’t have the answers: “Take what resonates with you and sow it to your heart…And if something doesn’t resonate with you-throw that stuff out the window on your way out!” (She doesn’t say “stuff”.) I love that. I want to be so wise one day (when I grow up), that I don’t give people advice. Just love instead. Life is such a journey of moments and I am learning to make space in my heart and mind to receive the gifts that come with each one. And every morning I will start all over again because His mercies are new. I am so grateful that He led me to peaceful green pastures- literally. At the Farm. 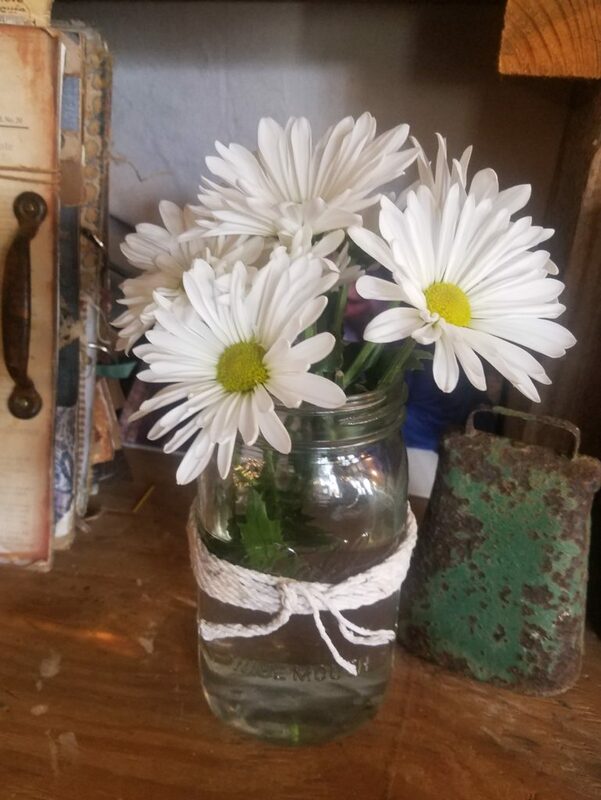 I even stopped to smell these gorgeous daisies (and snap a picture), because daisies hold a special place in my heart, and I knew they were a gift… just for me. At the end of our visit, Vikki recommended a book that was in her life-changing “top-ten”. I ordered it, because I know that books and conversations change lives. Do you have a favorite book that has made a positive impact in your life? I’d love for you to tell me. I’ll totally read it! I gave you a name. A beautiful name to start you on your journey, but I know it is only temporary. A whisper of your true name. Life is filled with whisper, you just have to listen for it. Birth is the first. Your welcome to the world. A sunrise, a crashing wave, a perfect harmony. All whispers of who you truly are. Listen for it when you are young, and learn to fill your life with moments of whisper. How do you know when you’ve heard it? You will know. Your heart fills with joy as you close your eyes to memorize the moment. Listen. Right then, when you discovered what you were made for. The head acknowledges the heart. A quiet whisper. My greatest prayer is to help you hear your whisper, because I know when I do, I’ll hear mine too. One day we will be given a new name. Our true name. Written on a white stone. The name I gave you will pale in comparison to the beauty of the name that perfectly describes you. Who else could sum up all that is you in one beautiful name? The One who knows your heart. Your true name will sound familiar and complete, and on that day your heart will be content. As you rest in the fullness of being known. Listening to the voice of your Beloved…no longer a whisper. 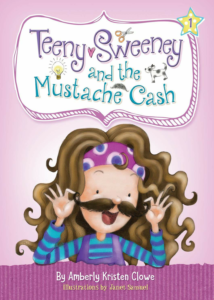 Tell us more about your new children’s chapter book Teeny Sweeney and the Mustache Cash. And lastly, Have you always wanted to be a writer? Thank you so much for chatting with me today on World Book Day!! I can’t wait to read your books and get to know Teeny Sweeney myself. 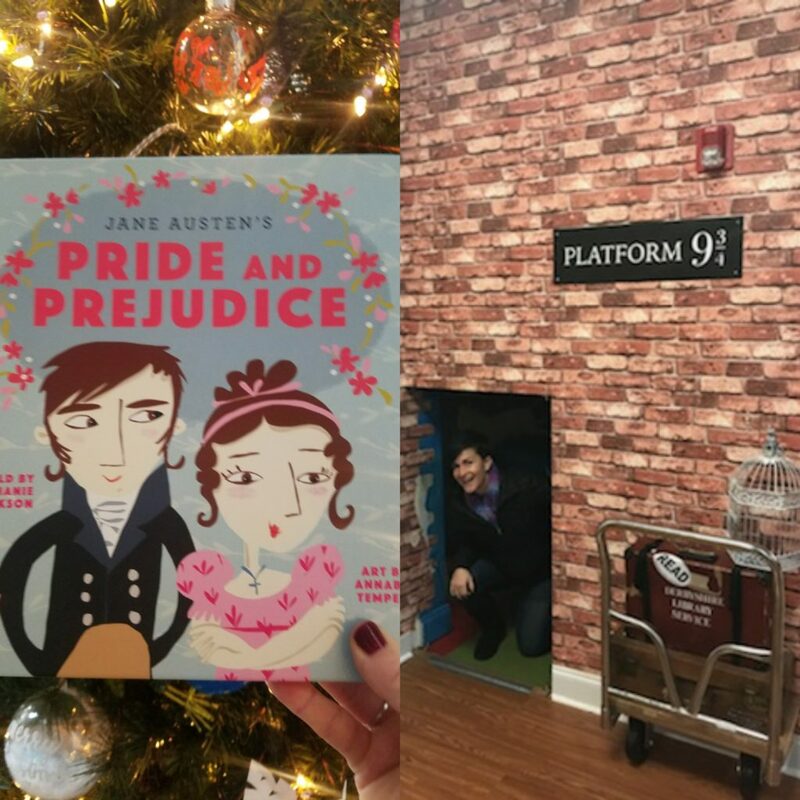 Our latest Bookstore adventure was one we have been looking forward to for a while! 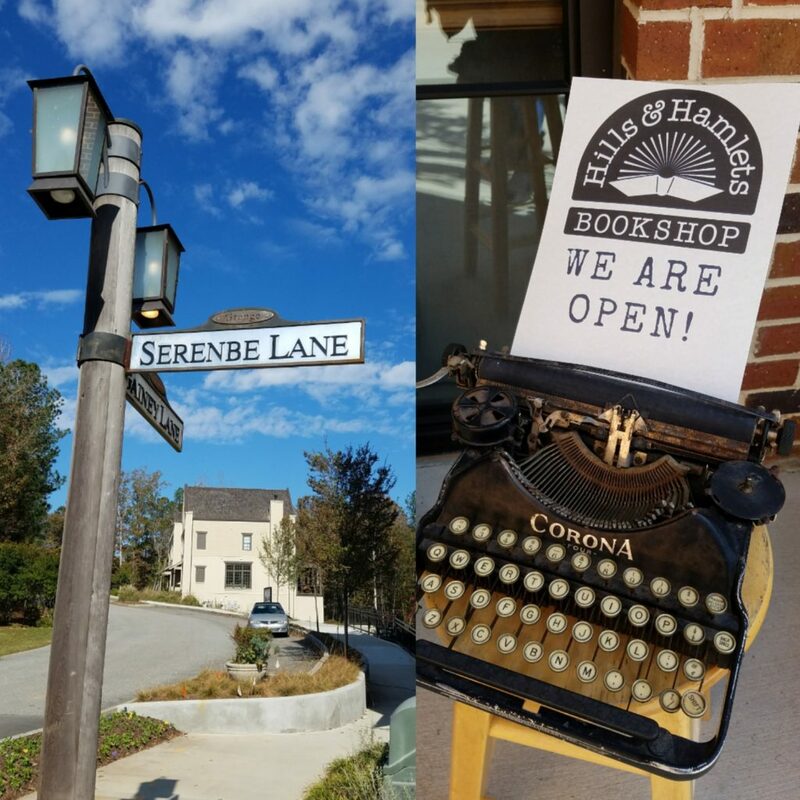 After visiting Hills and Hamlets Books Shop in Serenbe, GA and hearing about their sister store Underground Books in Carollton, GA, my book buddy Steen Jones and I couldn’t wait to check out this quaint book shop with a very romantic story…just in time for Valentines! Just as the name implies, you literally have to step down into the entrance to explore the bookish treasures in the Underground. We were met by a smiling employee, Miranda, who was excited and clearly to proud to show us around. They boast of Rare, Used and Anitiquarian which we got a taste of at Hills and Hamlets, but this is Underground’s specialty. 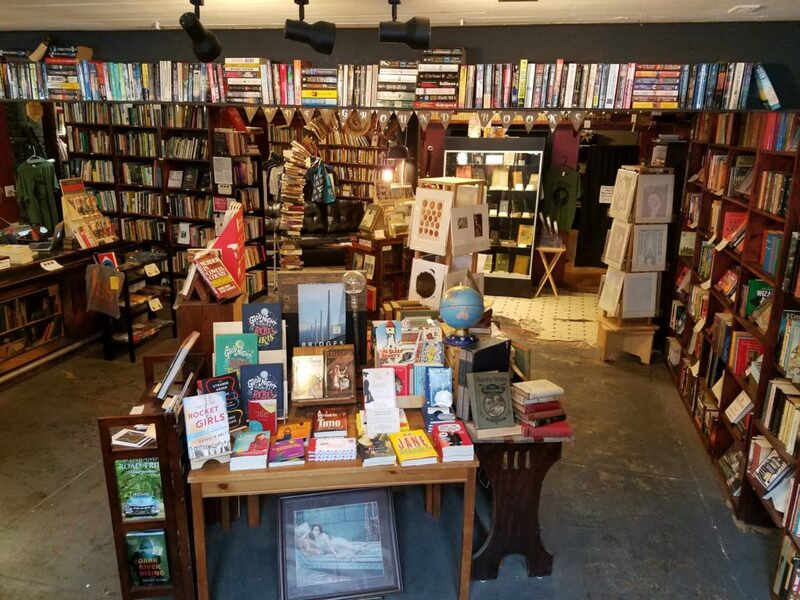 They have a curated offering of popular titles in all genres, but they also have a highly satisfying quirky collection of used and vintage books that you didn’t even know you wanted. You could tell every space and shelf was well thought out. I wanted to look at everything, but of course I was most interested in the children’s section. I walked through a tunnel of books into another area of the store and…bingo. Mixed between the fan favorites were adorable children’s classics and even fun oversized books like this gem by the Queen Bee herself, Jane Yolen. I felt like a kid holding this huge book and watching the feet of passerbys outside the half window. The atmosphere was cozy and full of imagination and artistic flair. 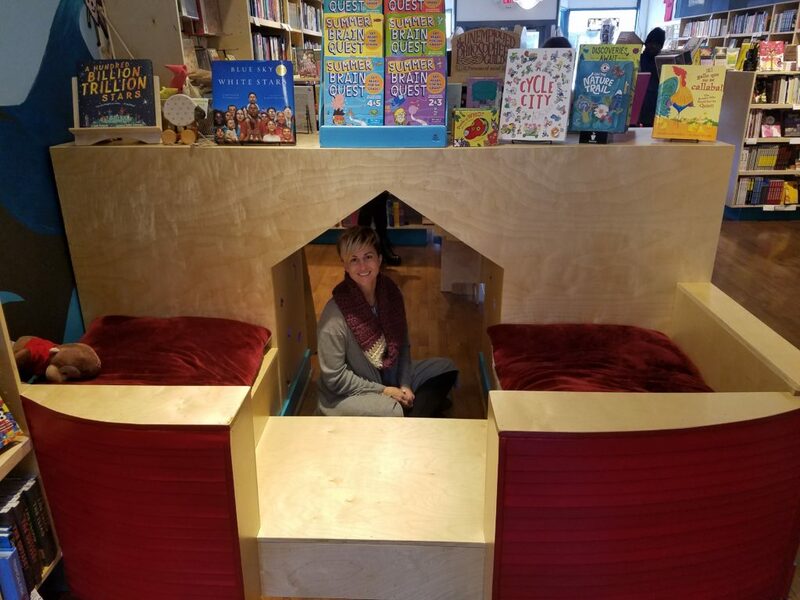 Right smack in the middle of the store is the “signature piece” of the Underground, the famous Book Arch that was actually made for owners Megan Bell and Josh Niesse for their wedding! How romantic is that? 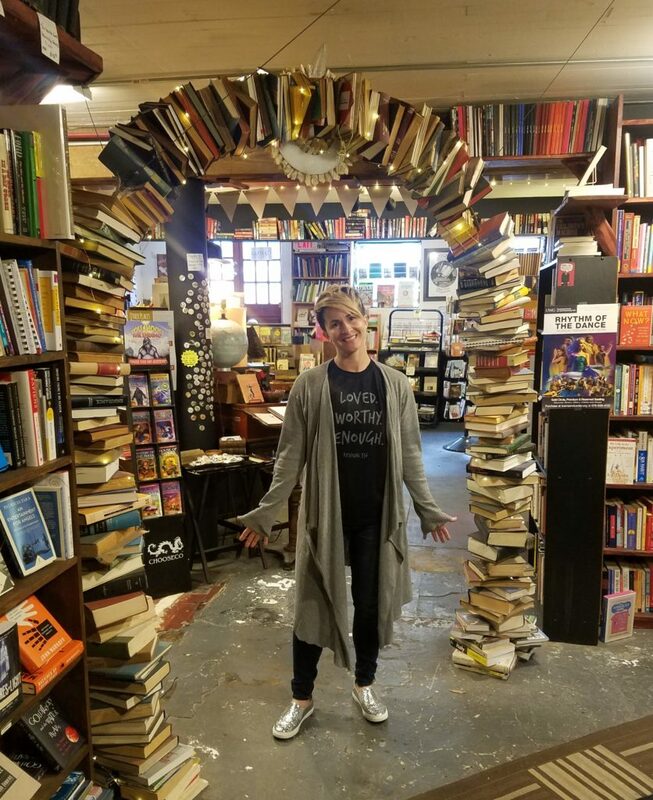 I had to get a picture and file it away because suddenly I had book arch envy. Underground Books has a very unique personality in every corner and shelf. The glowing lamps and Edison bulbs mixed with the comfy chairs and even the music made you feel like you were in another bookish world. We could have definitely hung out all afternoon with Miranda, but we were hungry, so she recommended the Charleston-esque Brown Dog Restaurant just around the corner of the historic downtown square. Super good food and super fast service. We didn’t realize until we noticed the decor inside that we were visiting on Fat Tuesday so that was a bonus. 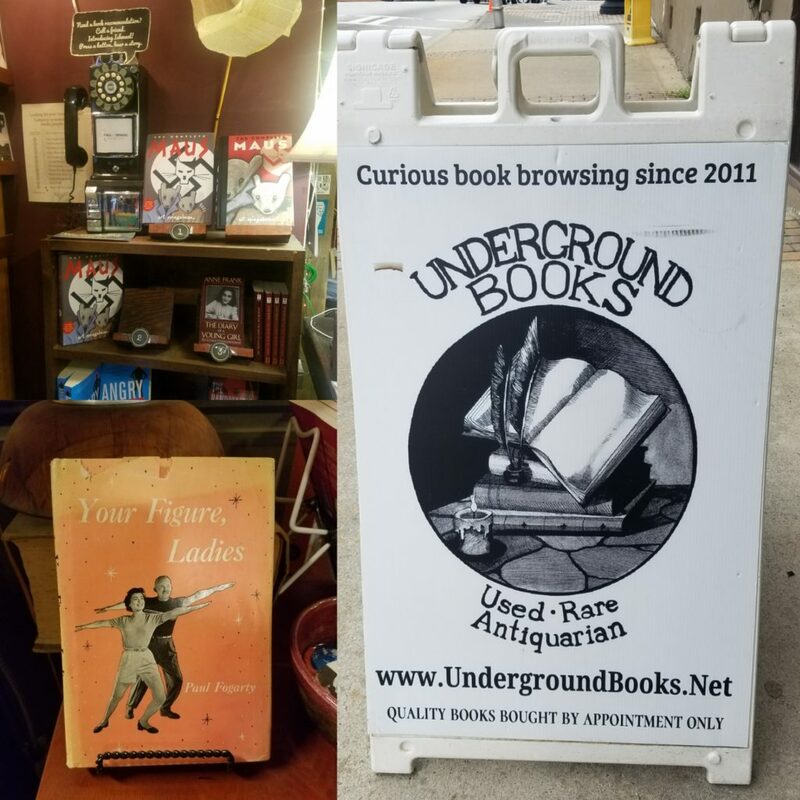 If you are ever in Carollton enjoying the fun and unique shops downtown, you have to stop by Underground Books and say Hi to Megan and the gang. 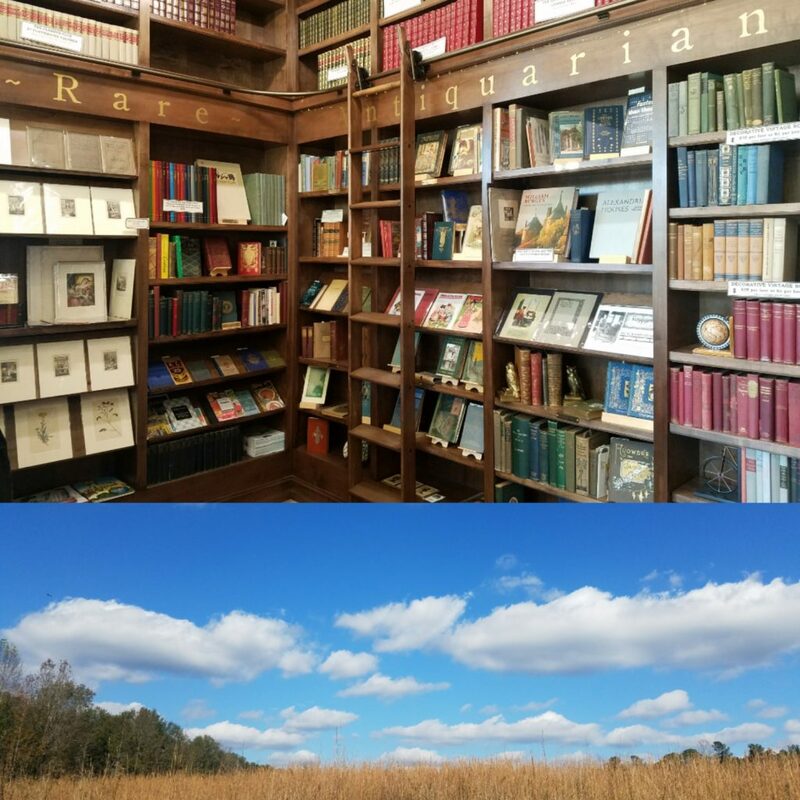 You’ll find all manner of comforts and curiosities in a book lovers heaven. Sign up for my newsletter and stay up to date on the release of my debut picture book The Yucky Words coming out in August! My third stop on the Bookstore Blog Tour was to Little Shop of Stories in Decatur, GA. My bookstore buddy Steen and I braved the frigid temps to explore Decatur “where it’s greater”, which has become a trendy fun little area of Atlanta with tons of cute shops and yummy food- but, we were on a mission. 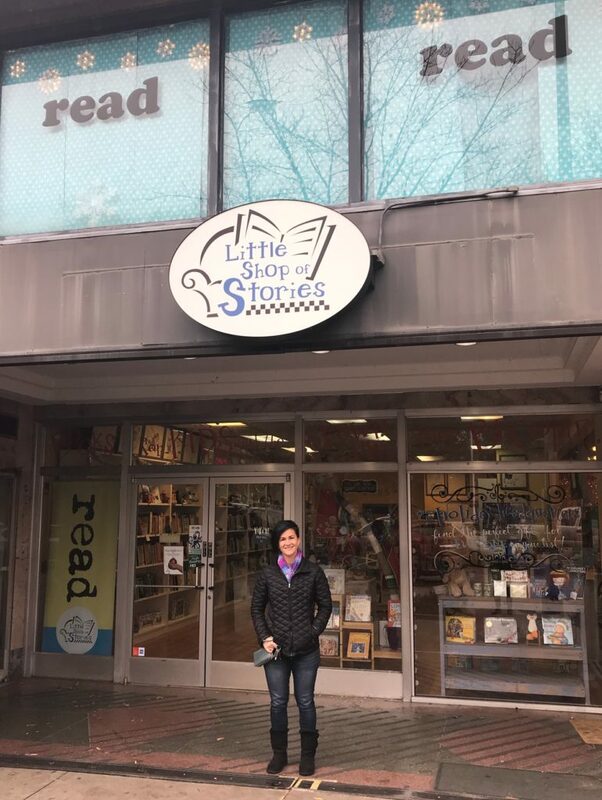 I was so excited to be visiting this adorable bookstore because I knew they catered to children and I absolutely LOVE the store name. 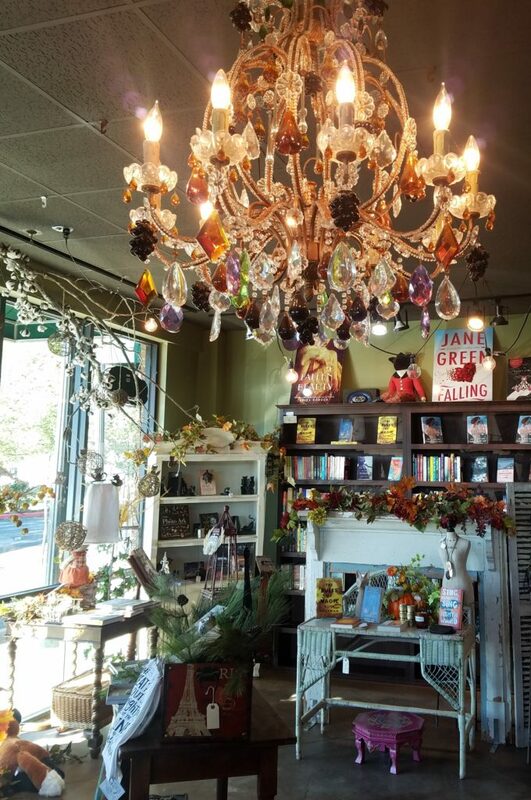 Little Shop of Stories has been open since 2005 and is owned by co-owners Dave and Diana. Also to note, they are right next door to a popular coffee shop so you can sip a latte while you browse. Two thumbs up. 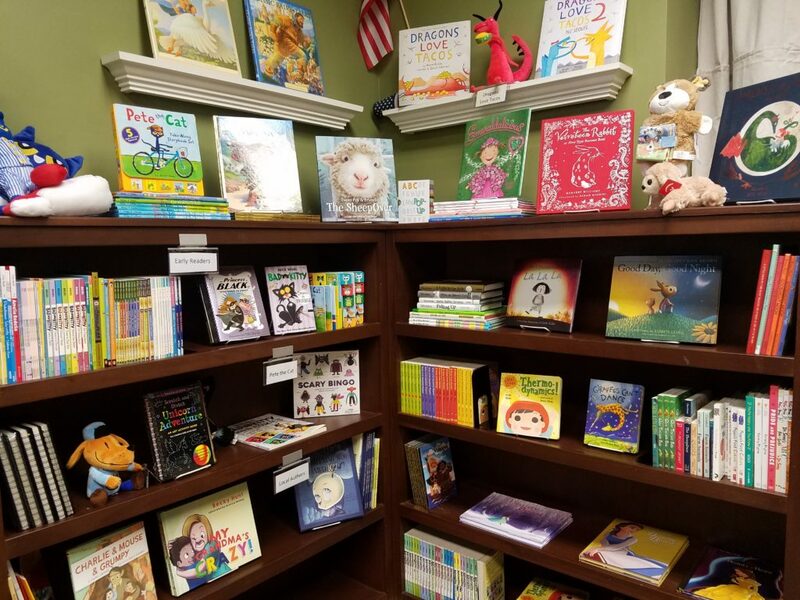 Sure enough, I was welcomed with a gorgeous wall of picture books and beautifully displayed Christmas themed books and gifts. I noticed right away that they had huge framed illustrations with author signatures bordering the ceilings (including a blank one with BIG signature from B.J. Novak. HA!) They had some pretty impressive names and Justin, the manager told us that they had just hosted Oliver Jeffers! 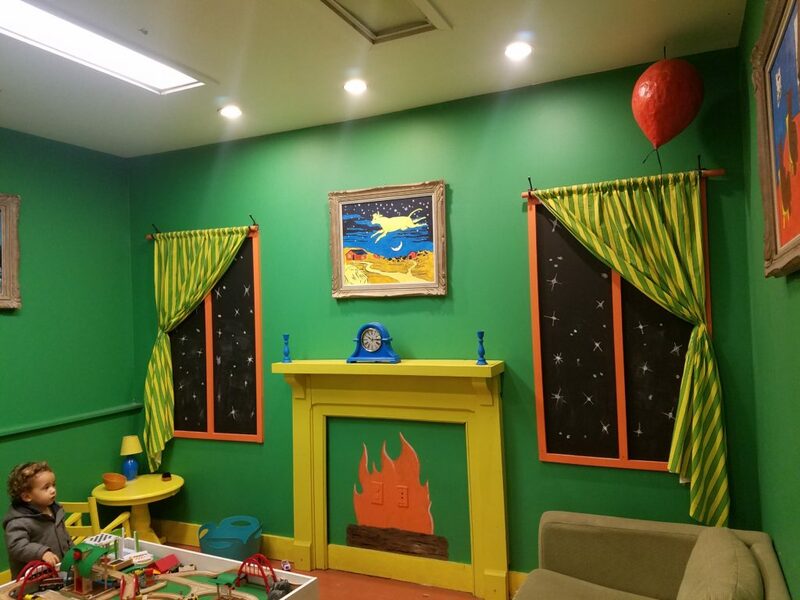 It was the Great Green Room from the classic Goodnight Moon! Seriously, this was my most favorite part of the store. It looked exactly like the illustrations from Margaret Wise Brown’s most famous bedtime story. There was a red balloon… and a picture of a cow jumping over the moon. And three little bears sitting on chairs. There was even a comb and brush and a bowl full of mush! And an adorable curly head boy whispering “hush”. Kidding. But he was really stinkin’ cute. I mean- what an amazing idea! We were told that this creative space was co-owner Dave’s idea and just one of his (many) fun projects. When I finally decided to leave the green room (sniff,sniff) I found the middle grade and young adult books. They do have a small selection of adult titles in case you want something boring to read. Totally kidding. 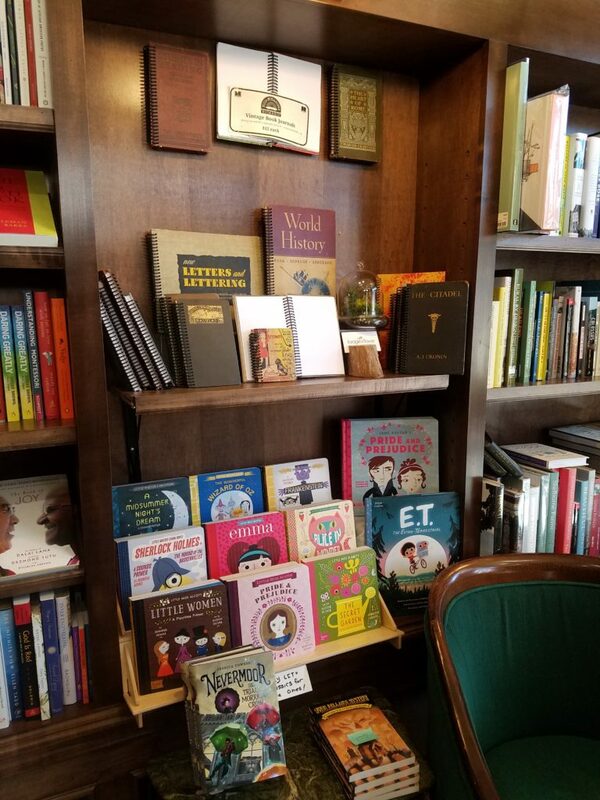 Actually because their adult section is small it is also very curated so you’ll be sure to find a great book. If you look closely at the shelves you’ll notice little cards sticking out of different spaces. 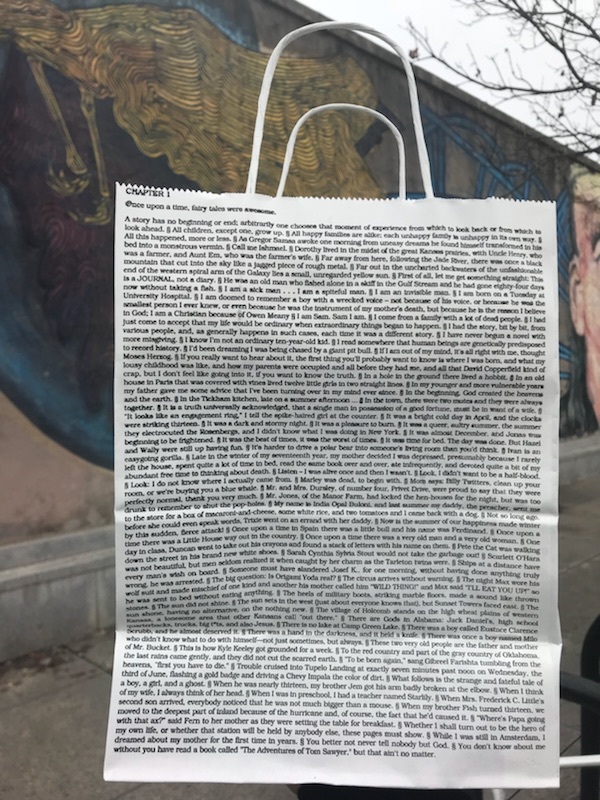 These are handwritten “reviews” done by the employees on a weekly basis. 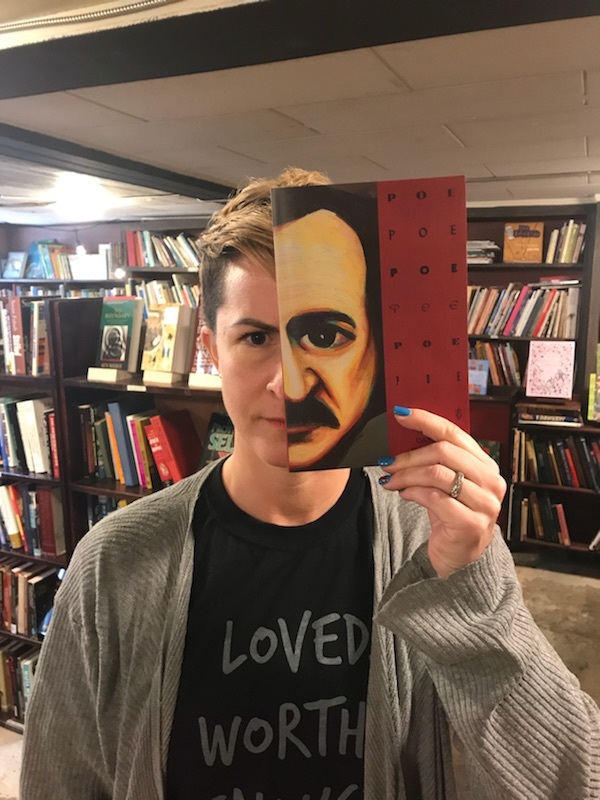 What a fun way to highlight a book! I’m always wanting a good recommendation. I snagged a present for my littlest one and the bag they put it in featured first lines from famous novels. How fun is that? On our way out there was an entire wall of books about kindness, which is the theme of my picture book The Yucky Words, available August 2018. 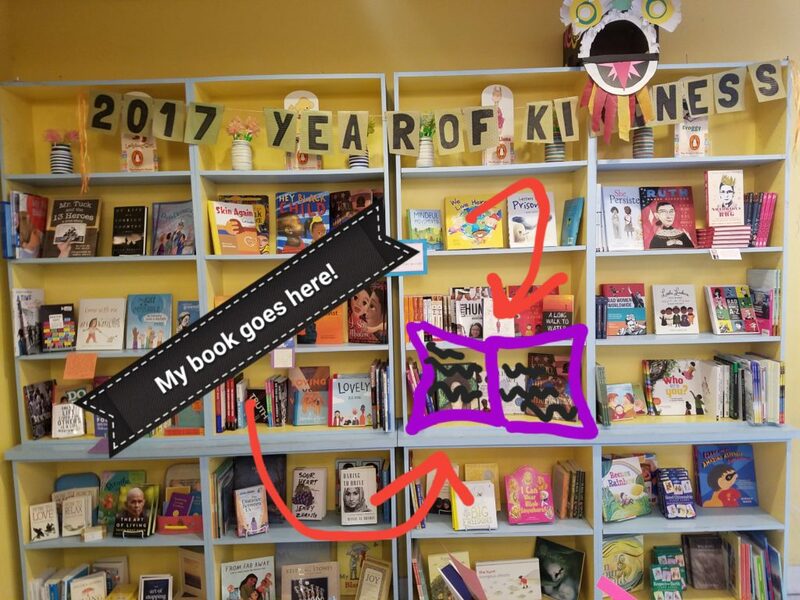 I couldn’t help but envision it on the shelf, because I know that the kindness revolution will continue on into 2018. 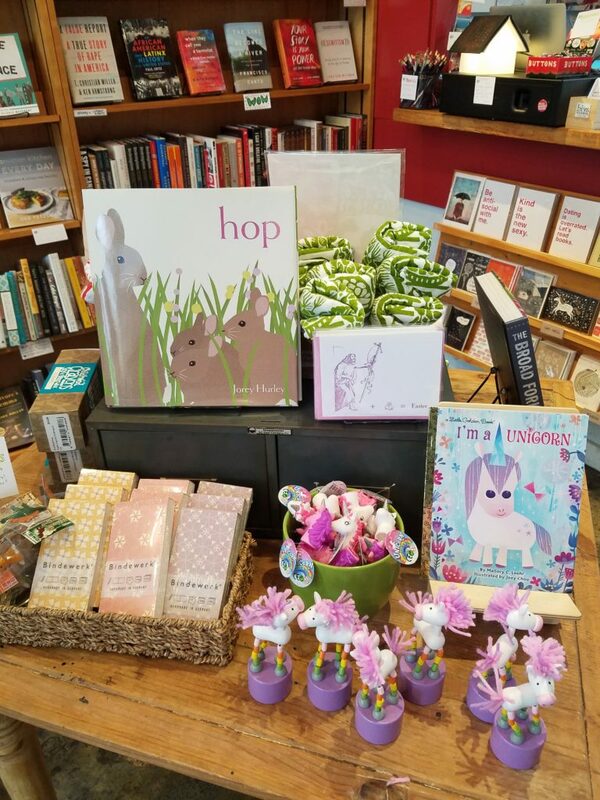 I was very impressed with Little Shop of Stories in Decatur. I couldn’t wait to get home and show my kids the pictures. Of course they were instantly mad at me for not taking them, so it looks like we’ll be back soon for them to walk through Platform 9 3/4 and read in the great green room, while mommy sips her latte and inhales the best smell on earth: Books. 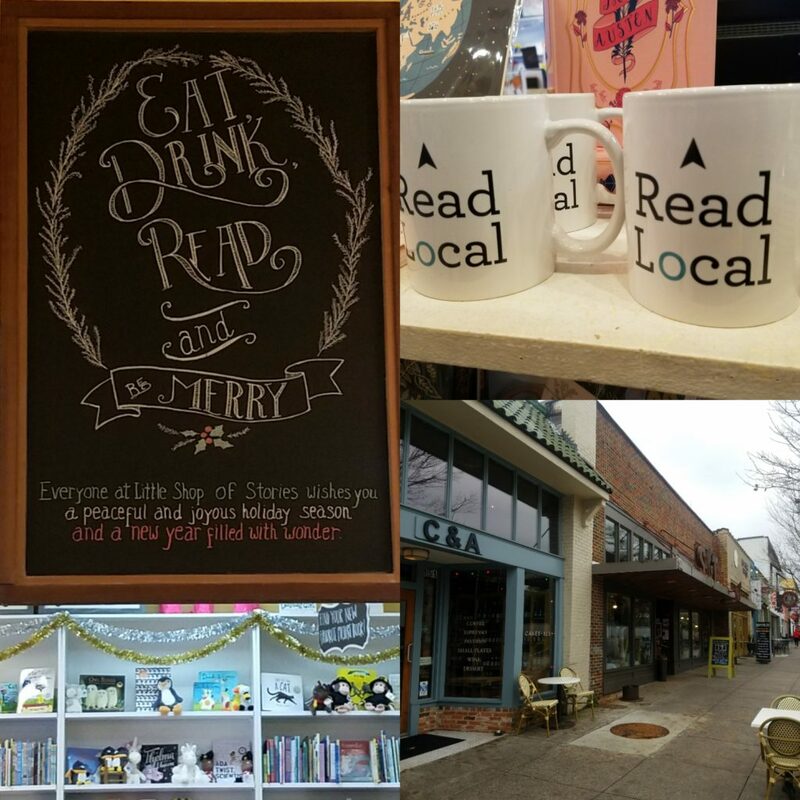 In trying to come up with interesting things to blog about, I had a writer friend of mine had the incredible idea to blog about local independent bookstores! 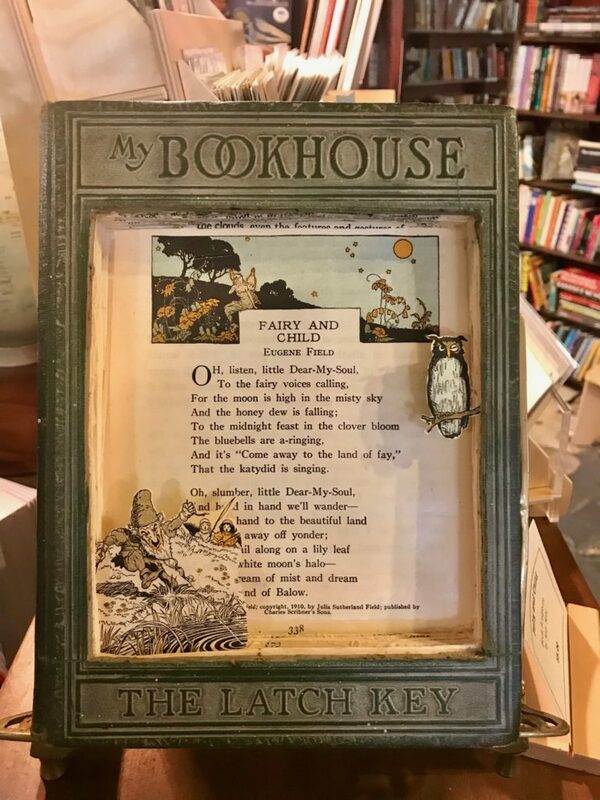 I thought it was a perfect blog subject because personally I would LOVE to read about and get a sneak peek into the wonderful world of small bookstores. 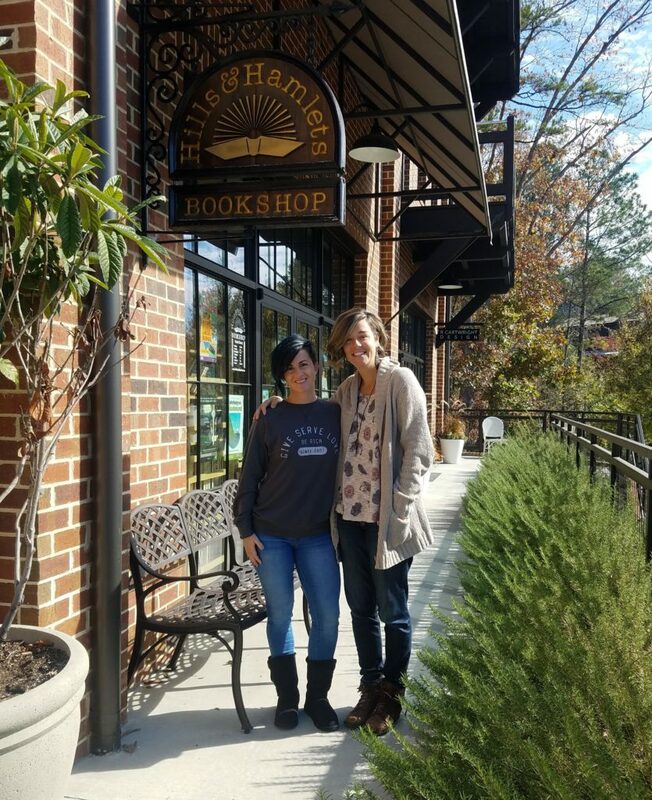 So I stole shared her idea and we started with my favorite little bookstore, FoxTale Book Shoppe in Woodstock, GA.
Ok, so I may be a little biased on this one because it is only 10 minutes from my house, and right in the middle of one of the cutest (and fastest growing) communities in Georgia. 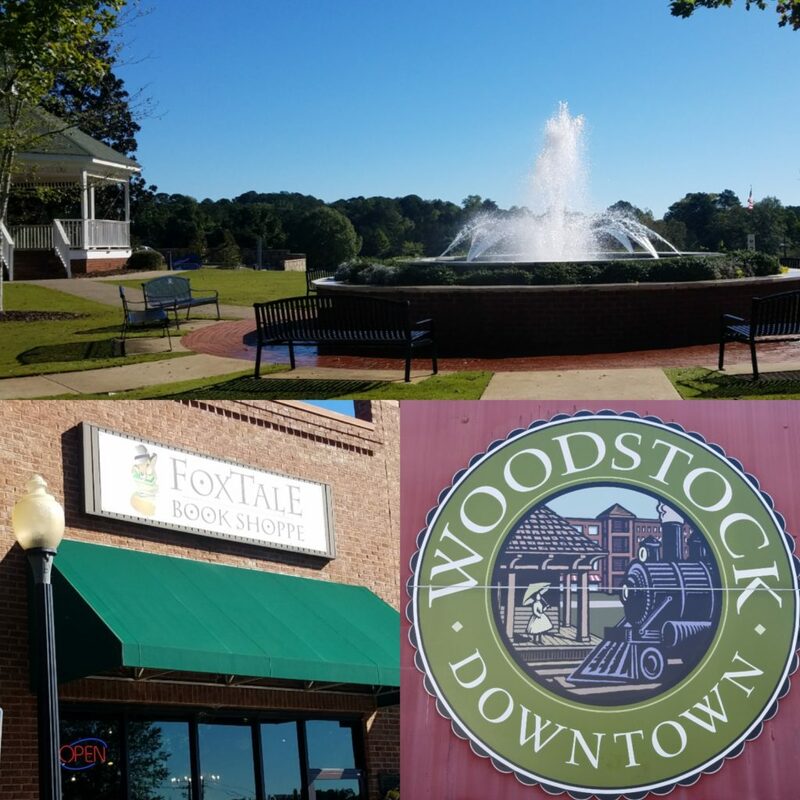 There is so much to do in Downtown Woodstock, and FoxTale is one of the few businesses to witness the growth first hand. 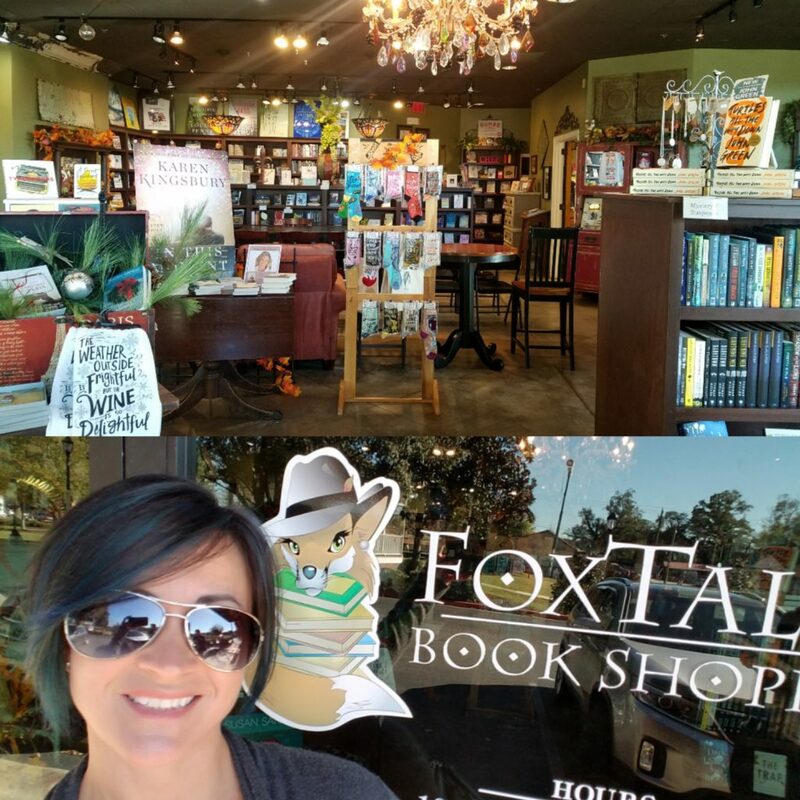 FoxTale has been open for almost 11 years and the owners are Karen & Jackie. 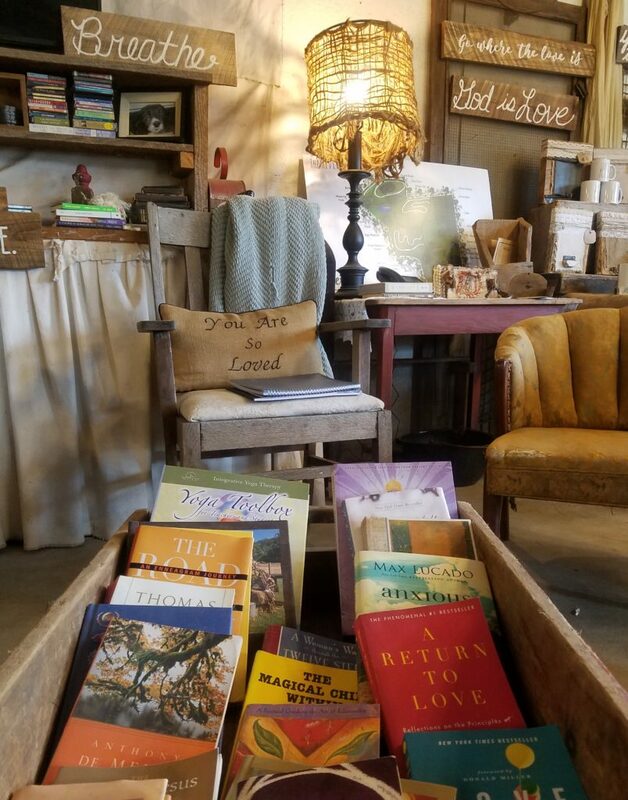 Nestled between an outside amphitheater, a park with beautiful white gazebos, a railroad track and a super cutesy shops, FoxTales is in a perfect location for a darling bookstore. 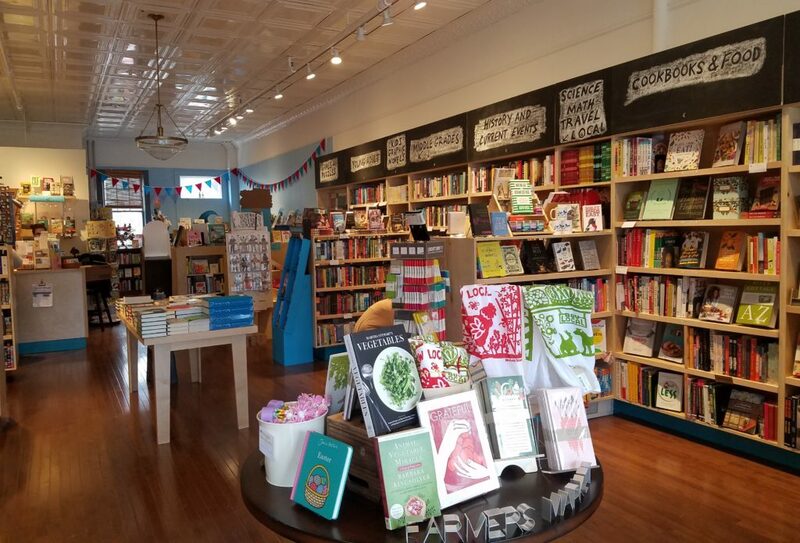 One of the first things I noticed when coming to drool over research this adorable book haven was the hours of operation: 10:00am to Dark -Thirty Monday through Saturday (And sometimes Sundays). Yes! They had me at hello. The window displays were fall themed with beautiful fall leaves and pumpkins. Which made me instantly (and stereotypically) assume that women were to blame congratulate for the welcoming décor. 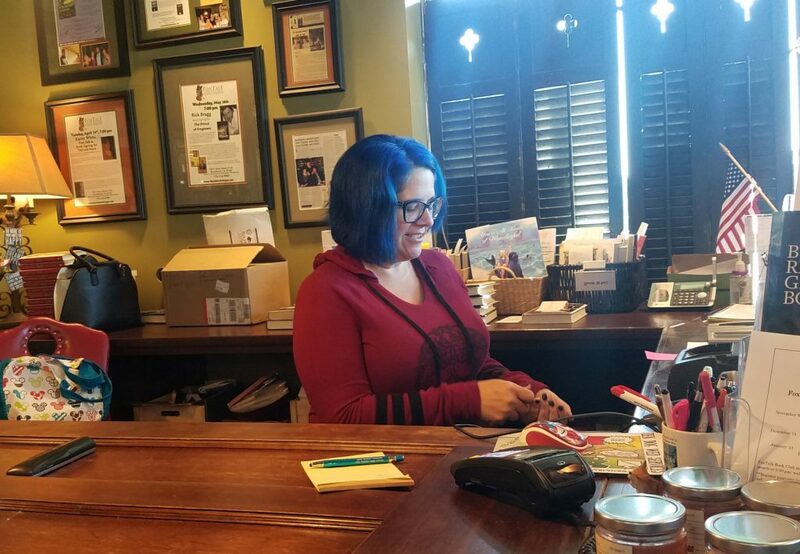 When I rounded the first book shelf I was greeted by a friendly woman who I’m sure said, “Good morning!” or “How can I help you today?” but I was distracted by her BLUE hair. Yes, it was fate. She could have said anything, but she had me at azure coiffure. As if things couldn’t get any better she introduced herself as “Hyphen”. What? Could she be any cuter?? Hyphen graciously showed us around the store while I made a mental note to name a future child pet of mine “Hyphen”. My new best friend Hyphen. 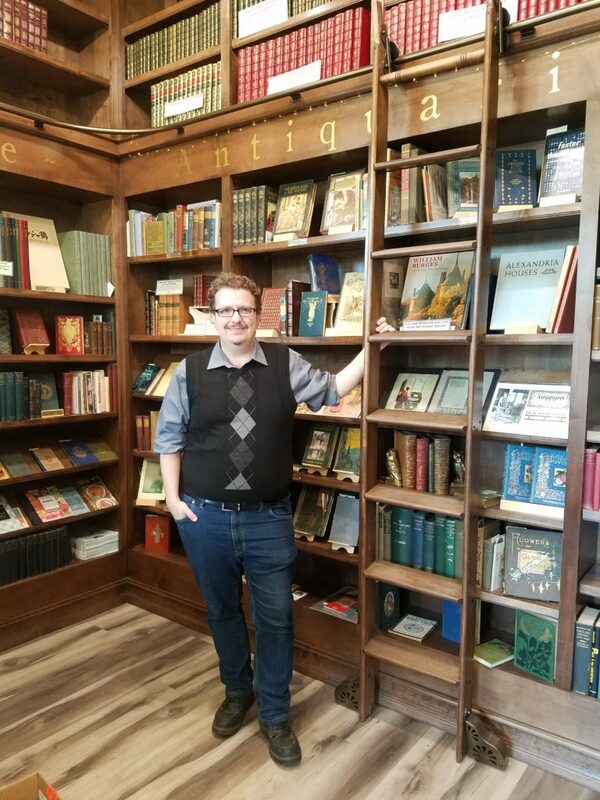 The store itself was perfectly organized into various genres of books including staff picks which is always one of my favorite things to look for. Hyphen was clearly excited to talk about the favorites on her shelf and it didn’t take long to figure something out about Hyphen- girlfriend LOVES books. Which makes me love Hyphen…but I digress. Picture books are my favorite. 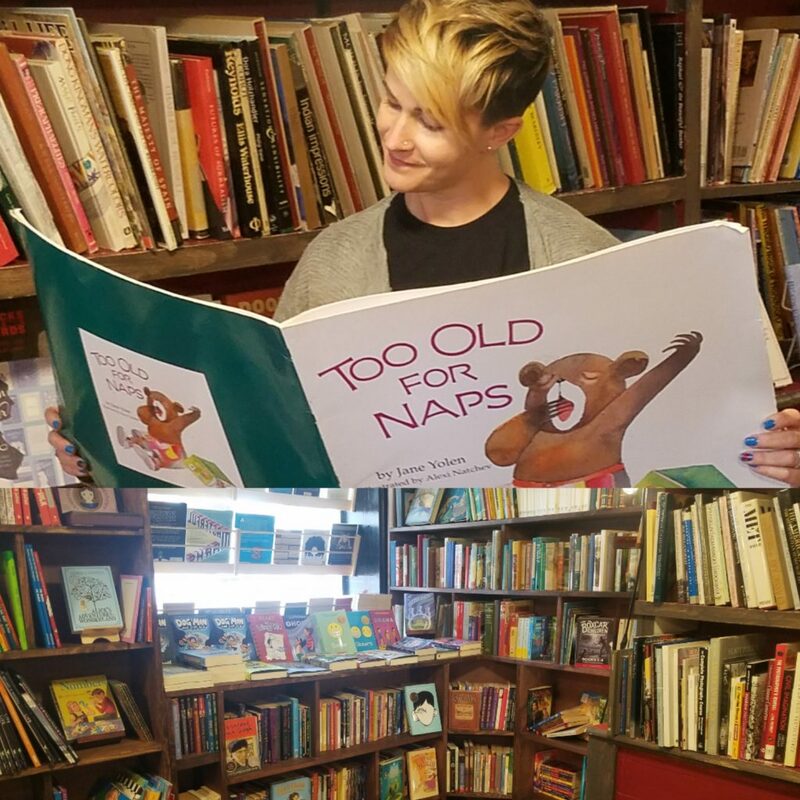 Of course my favorite part of the shop was the children’s book section. A separate room with wooden French doors (to keep out boring adult talk I guess) filled from floor to ceiling with yummy picture books. Actually the ceiling was taken by a big colorful hanging bicycle. 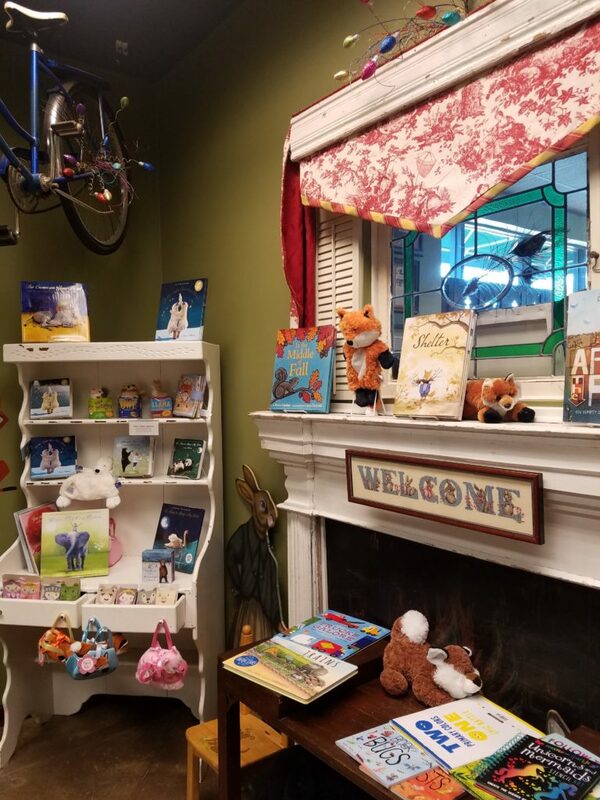 Hyphen, who is also the storytime reader at FoxTales, says she tells kids they can touch ANYTHING in the kid’s room except they may not go behind the curtain at the back wall. When kids sarcastically ask to touch the bike she offers to pick them up. Because Hyphen is as cool as her name. I was just about to ask her to hoist me up when she said, “Wait! I have something for you.” My friend and I looked at each other in surprise while she slipped away behind the now very intriguing (and off limits) curtain. She came back with two bags with two books inside. They were left over from a recent event and she GAVE them to us! How cool is that!! 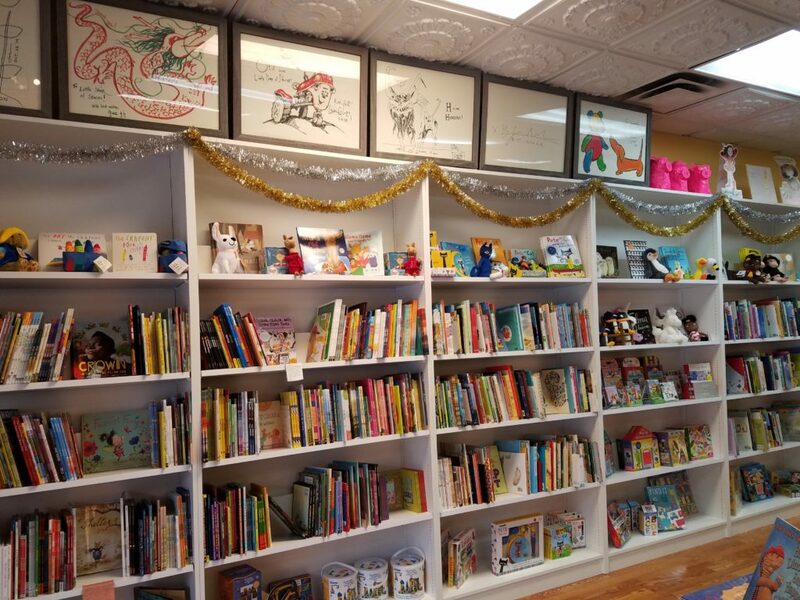 Needless to say my impressions of FoxTales Book Shoppe in Woodstock were exceedingly more than I could have hoped for from MY local bookstore. The ambiance, the staff, the selection and the events that they offer were enough to make me grab a copy of their calendar and subsequently fill up my own. I even loved the little touches like the stained glass fox, fox pillows,stuffed animal foxes (or is it foxii? 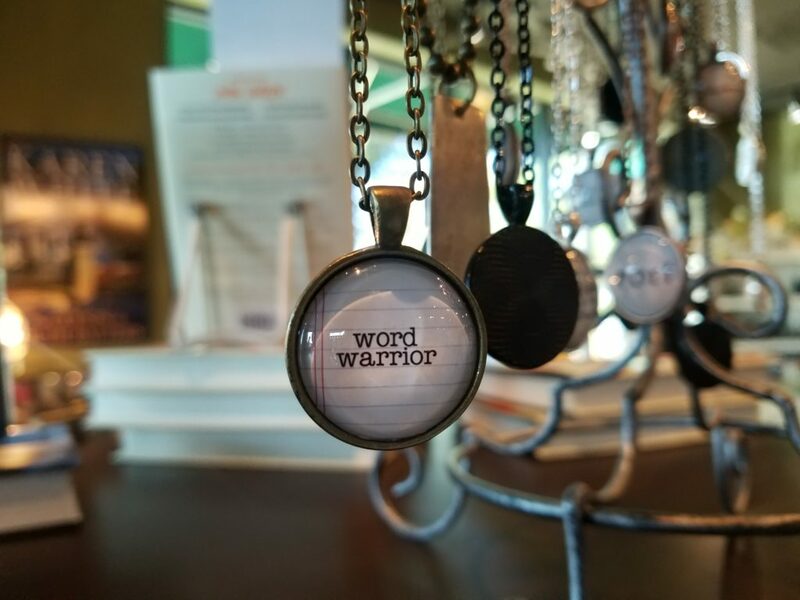 ), and the gorgeous accessories like scarves and necklaces to please any bibliophile. If you are anywhere near the Woodstock area I highly recommend visiting FoxTale. And tell my BFF Hyphen I said hello. How many foxes can you spot? Need I say more? 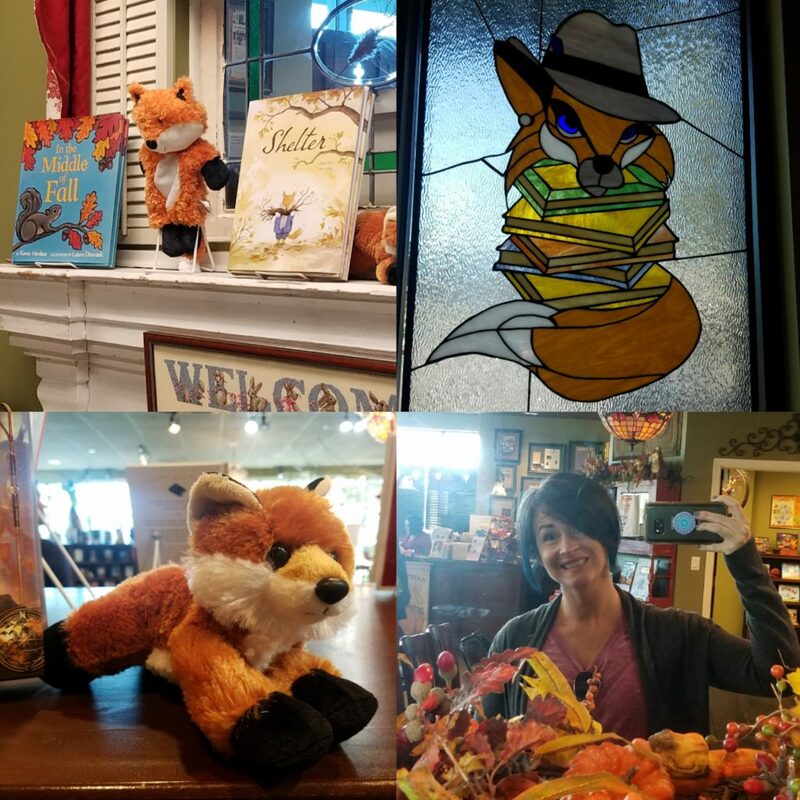 Once you’ve worked up an appetite enjoying FoxTale Book Shoppe, walk on over to Cupcakealicious and grab a a sweet treat like gourmet cupcakes, ice cream, King of Pops and more! And then there is the Pie Bar which needs little explanation except that these pies are handcrafted and “made for the masses”. 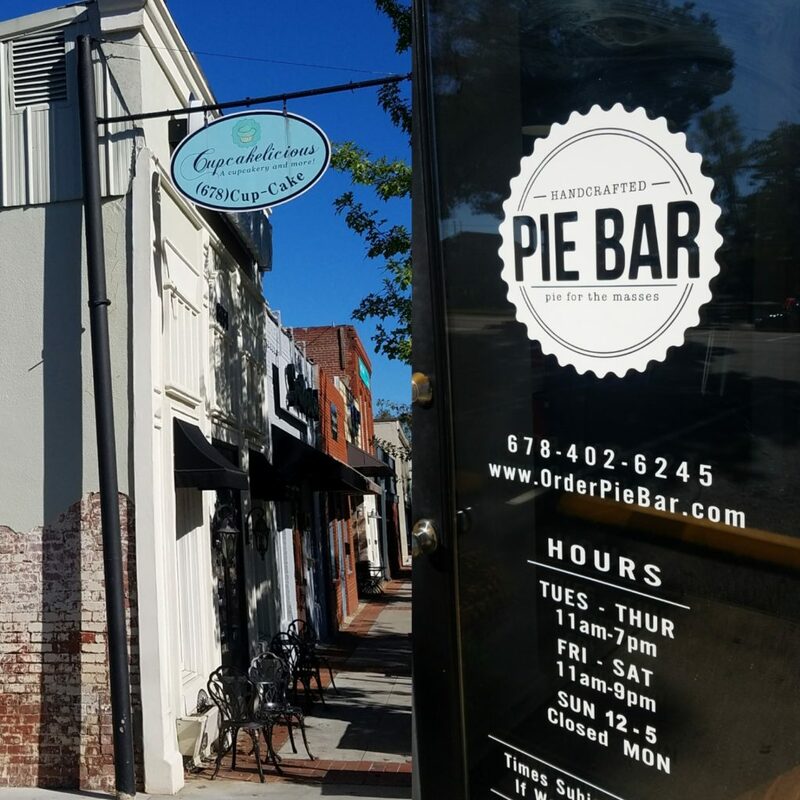 The owners of Pie Bar, an adorable couple, encourage patrons to enjoy pie everyday instead of only for special occasions.